Coral reefs begin to form when free-swimming coral larvae attach to submerged hard surfaces. As the corals grow and expand, reefs take on one of three major characteristic structures – fringing, barrier or atoll. Fringing reefs, which are the most common, project directly from the hard surfaces, forming reefs and expand in horizontal and vertical directions. Barrier reefs also project, but at a greater distance. If a fringing reef forms around a rocky island that subsides completely below sea level while the coral continues to grow upward, an atoll forms. 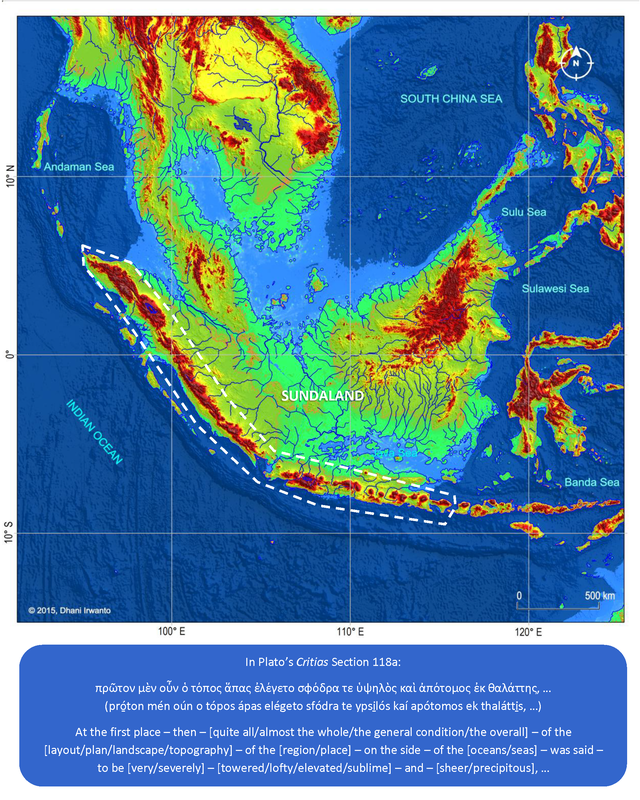 The Sunda shelf was exposed during the Ice Age, the most recent glacial period occurring during the last years of the Pleistocene, from approximately 110,000 to 12,000 years ago. It was in the Sundaland that man first found the ideal climatic conditions for development, and it was there that he invented farming, structure building, seafaring and civilization from 70,000 years ago. People of these civilizations were dependent on water for their mobilizations, so coastal areas were the most suitable places to live and then communities were formed there. They used stones and woods to build houses and other buildings since these materials were abundant in the region. The Ice Age waned during the period 14,000 – 7,000 years ago that accompanied by sea level rise – as much as 130 m. The costal communities then moved to adjust the changing coastlines and remnants of their buildings were left sank under the sea. Finding the most suitable places to grow, coral reefs were formed on these buildings. 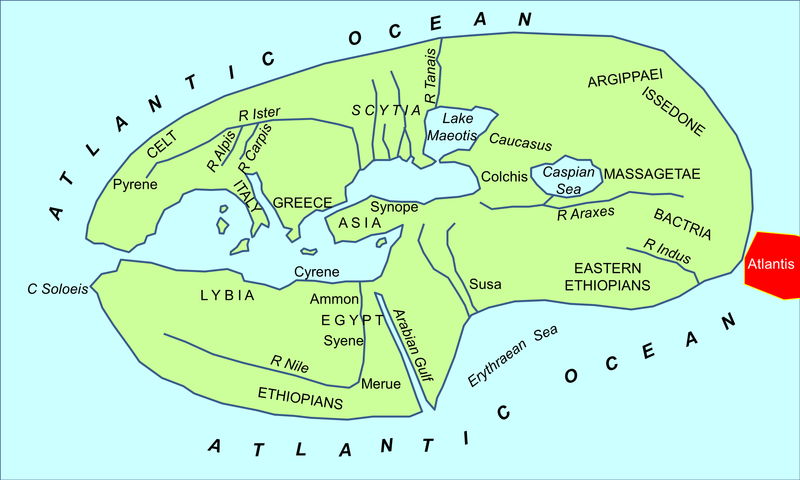 Based on the data of coral reefs and bathymetric maps, the author identifies the probable sites and ages of the ancient civilizations, as shown on the attached map. Note that not all of the coral reef sites were ancient civilizations because coral reefs could form on natural hard surfaces as well. According to Plato’s narrative, Atlantis ended at around 11,600 years ago. Based on the above study, the location of the capital city of Atlantis is expected at one of the very ancient civilization sites shown on the map. Plato also wrote that the capital city of Atlantis at Solon’s time had been covered by a coral reef so it was not navigable. Copyright © Dhani Irwanto, 2016. All rights reserved. 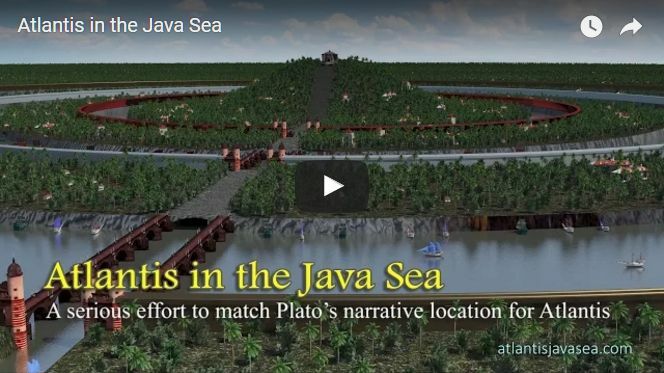 After a comprehensive research, the author discloses a new theory hypothesizes that the lost island and city of Atlantis is located in Java Sea, Indonesia, as written in a book Atlantis: The lost city is in Java Sea, published in April 2015. See evidence in hypothesized location. The story of Atlantis comes to us from Timaeus and Critias, Socratic dialogues, written in about 360 BC by Plato. There are four people at this meeting who had met the previous day to hear Socrates describes the ideal state. Socrates wants Timaeus of Locri, Hermocrates, and Critias to tell him stories about Athens interacting with other states. The first is Critias, who talks about his great grandfather’s meeting with Solon, one of the seven sages, an Athenian poet and famous lawgiver. Solon had been to Egypt where priests had compared Egypt and Athens and talked about the gods and legends of both lands. One such Egyptian story is about Atlantis. Atlantis, a likely legendary land nation mentioned in Plato’s dialogues Timaeus and Critias, has been an object of fascination among western philosophers and historians for nearly 2,400 years. Plato (ca 424 – ca 328 BC) describes it as a powerful and advanced kingdom that sank, in a night and a day, into the ocean about 9,000 years before Solon or around 9,600 BC. Plato (through the character Critias in his dialogues) describes Atlantis as a land larger than Libya and Asia Minor put together, located just beyond the monuments of Heracles. Its culture was advanced and it had a constitution suspiciously similar to the one outlined in Plato’s Republic. It was protected by the god Poseidon, who made his son Atlas king and namesake of the land Atlantis. As the Atlanteans grew powerful, their ethics declined. Their armies eventually conquered Africa as far as Egypt and Europe as far as Tyrrhenia (modern Lebanon) before being driven back by an Athenian-led alliance. Later, by way of divine punishment, the island was beset by an earthquake and a flood, and sank into a muddy sea. According to Critias, Solon, while wrote his poem, enquired into the meaning and knowledge of the names and had translated them into their own language; when copying them out again translated them into Greek. Thus, the names include Poseidon, Heracles, Atlas, Athens, Egypt, Libya, Tyrrhenia and Europe are translated names which the originals were kept by Critias. Plato’s seminal work, The Republic, outlines the ideology of Plato’s perfect state, one in which the rulers are philosophers. It was written down in the early years of the academy which Plato had founded in ca 386 BC. This institution was his answer to his disgust with contemporary politics and was, in essence, to train the philosopher-rulers of a future Athenian state. The Critias dialogue is in direct response to Socrates demand to know how his ideal state will conduct itself in action. What Socrates means by this ideal state is of course the Plato’s “republic”. In essence, this story is to be an illustration of how the ideal state conducts itself in warfare against its neighbors. In considering the Timaeus and the Critias, which includes the story of Atlantis, it has to be read against the background of The Republic. The story of Atlantis as told by the Egyptian priest is probably ever really existed but Plato had been distorting the facts in order to support his ideology of an ideal state as in The Republic, or he added some embellishments of his own or aspects drawn from other legends. He embodied Athens as part of the story to show the greatest and noblest action of Ancient Athens, which was probably another state in the myth told by the Egyptian priest, created from records in their sacred registers preserved in their temples. The embodiment is evidenced that if Plato knows the location of Atlantis, which was bordering with Athens, he would surely mention the exact geographical location from his knowledge. If we apply a similitude of “particulate inheritance model”, which is commonly used in biological sciences, where as though the phenotype of Plato’s Atlantis is inherited from the original phenotype of Egyptian records, as a continuum in a series of “generations”. In the process, the “legacy” phenotype is determined by “genotype”, “epigenetic” and “non-inherited environmental” factors from the “ancestors”. The “genotype” factors are that part (“DNA sequence”) of the “genetic makeup” of the story. The “epigenetic” factors are the phenotypic trait variations of the story that are caused by external or environmental factors. The “non-inherited environmental” factors are distortions, embellishments and embodiments of the story by the tellers. “Genetic mutation” of the story may also occur in the process. The only known now is the inherited phenotype, so that those factors are not detected, but certainly has experienced. The pre-history of Egypt is known to the Neolithic period, beginning ca 6,000 BC or ca 8,000 BP. Yet, 9,000 years before Solon or 11,600 BP is beyond the historical span of Egypt. We could speculate that the ancient Egypt told by the priest is actually a primordial ethnic group and believed to be their ancestors prior the deluges and other catastrophes. The Egyptians were among the refugees and survivors of the catastrophes; then resettled on the land which is now called the Egypt. In the rescue, they brought records and registers, and hereinafter preserved them in their temples. Linguistic and alphabet studies of the Rejang culture in southwestern Sumatera conducted by among others Sir Thomas Stamford Raffles (1817), J Park Harrison (1896), EEEG Schroder (1927) and MA Jaspen (1983) show some correlations with the ancient Phoenician and Egyptian. Indonesian has ancient knowledge of pyramid building just like the ancient Egyptian; the Gunung Padang pyramid in West Java, Indonesia dated 23,000 BC or earlier is claimed to be earlier than those in the Egypt. The existence of Atlantis is supported by the fact that it is described in great details, mainly in Critias. In additions, various conditions, events and goods like the two-season climate, flood (tsunami), orichalcum, geographical features, buffalo and produces unknown to Plato are also described in detailed and lengthy words. The recent knowledge of late glacial and postglacial sea level rise and land subsidence that occurred almost precisely at the time described by Plato also becomes strong evidence to the truth of the story. What we call now by the name of “Atlantic Ocean” is not the same as that of the ancients. Herodotus, Aristotle, Plato, Strabo, and several other ancient authors are very specific on the fact that the “Atlantic Ocean” – otherwise called “Ocean of the Atlanteans”, “Outer Ocean”, “Kronian Ocean”, Mare Oceanum (“Ocean Sea”) or Mare Magnum (“Great Sea”) – was the whole of the “earth-encircling ocean”. This Ocean surrounded the whole world then known, that of Eurasia and Africa. In other words, the Atlantic Ocean of the ancients was the World Ocean that is coterminous and encircles the entire globe of the earth, and which we now arbitrarily divide into Pacific, Indian and Atlantic, despite the fact that all three are coterminous. The Atlantic Ocean or, rather, Ocean of the Atlanteans, of the ancient Greeks of the time of Plato and Aristotle was not only the one we call by that name, but included the Indian Ocean and that portion of the Pacific Ocean along the eastern coast of Asia. In Timaeus Section 24e, Plato asserts that Atlantis was located “at a distant point in the Atlantic Ocean”, also implies that Atlantis was in the ocean far or what we know today the eastern Indian Ocean or the Pacific Ocean. 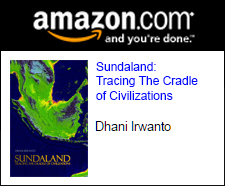 The Sundaland or specifically Indonesia has been advocated as a site for Atlantis. Key to this argument is that the Ocean of Atlantic refers to the ocean which encircles Eurasia and Africa, which was the historical understanding until the time of Christopher Columbus. 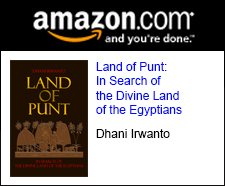 Proponents of this idea claim that natives of Sundaland who fled the rising waters or volcanic explosions eventually had contact with Ancient Egyptians, who later passed the story onto Plato who gets some but not all of the details correct, including location and time period. The first suggested linkage between Atlantis and Indonesia came from the leading theosophist, CW Leadbeater, in a booklet, The Occult History of Java, published in 1951. An American polymath William Lauritzen and about the same time a Brazilian nuclear Professor Arysio Nunes dos Santos also made the Sundaland internationally known hypothesis. Zia Abbas, a computer scientist, claims to prove that Plato’s Atlantis is to be found in the South China Sea. Other high-profile representative of this Atlantis-localization is an Indian molecular biologist Sunil Prasannan who has worked in London. In 2013, joined also the Indonesian geologist Danny Hilman Natawidjaja after its discovery that the Mount Padang in the province of Cianjur, West Java, was apparently brought by people in pyramid form about 13,000 years ago, the adoption of Atlantis was in the greater of the present-day Indonesia located. The Sundaland theory about the origin of civilization is postulated by a British molecular biologist Stephen Oppenheimer. He makes a case that the rise in ocean levels that accompanied the waning of the Ice Age – as much as 150 m – during the period 14,000 – 7,000 years ago, must be taken into account when trying to understand the flow of genes and culture in Eurasia. 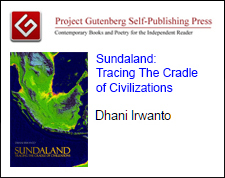 Citing evidence from geology, archaeology, genetics, linguistics, and folklore, he hypothesizes that the Southeast Asian subcontinent of Sundaland was home to a rich and original culture that was dispersed when Sundaland was mostly submerged and its population moved westward. Sundaland’s culture may have reached India and Mesopotamia, becoming the root for the innovative cultures that developed in those areas. He also suggests that the Austronesian languages originate from Sundaland and that a Neolithic Revolution may have started there. The Sundaland hypothesis is also flanked by the studies of the geologist and geophysicist Robert M Schoch, together with Robert Aquinas McNally, in 2003 published a book in which to express the two authors have reasons to suspect the concept of pyramid construction had been developed by a lost civilization, which formerly existed in Sundaland. In Critias Section 108e, Plato describes that “… nine thousand was the sum of years which had elapsed since the war which was said to have taken place between those who dwelt outside the Pillars of Heracles and all who dwelt within them …” and in Timaeus Section 24e: “… the island was larger than Libya and Asia [Minor] put together, and was the way to other islands, and from these you might pass to the whole of the opposite continent which encompasses the true ocean …”. 9,000 years before Solon’s day (ca 600 BC) means approximately 11,600 years BP; the sea level at this time was around 60 meters below the present-day sea level. 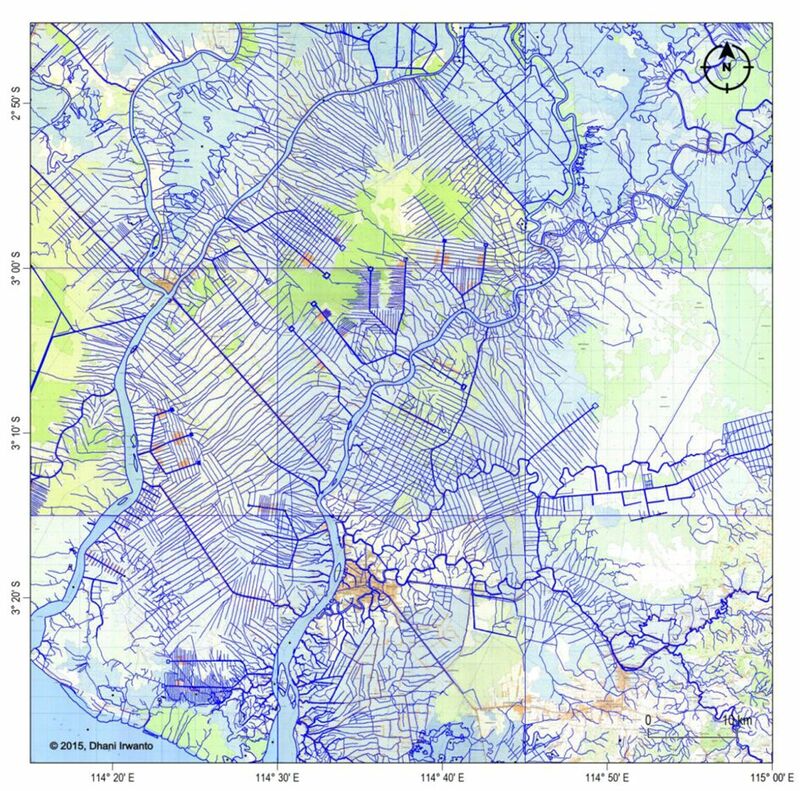 The map showing the lands at 11,600 BP is extracted by the author from the GTOPO30 elevation grids published by USGS. Traveling further from Sundaland, one may reach some islands like Nusatenggara Islands, Sulawesi, Maluku Islands, Mindanau and Luzon. Passing through these islands, one may reach the opposite continent, ie the large “Sahul Continent” combining the Australian Continent, Papua and the land connecting them. This continent encompassed Pacific and Indian Oceans. So that Plato’s statement: “… was the way to other islands, and from these you might pass to the whole of the opposite continent which encompasses the true ocean …” is true to point that Atlantis is hypothesized located in Sundaland. Looking at the map, we will see that Sundaland is larger than Libya and Asia Minor, precisely what Plato affirms in his discourse on Atlantis. The description in Critias Section 118a that “At the first place then the general condition of the landscape of the region on the side of the ocean was said to be very lofty and precipitous, …” does paint a reasonably accurate picture of the Sundaland region as it would have been during the Ice Age. Plato’s words of “benefit of the annual rainfall”, “abundance of water”, “excellently attempered climate”, “summer and winter” and “twice in the year … in winter … and in summer” are strongly interpreted as characteristics of a tropical climate. Plato uses the words “summer” and “winter” to describe the “dry season” and “wet season” as there are no such seasons and there were no such words in Greece. The Plato’s Atlantis, as in Critias, was characterized as being an agricultural country. The country was full of rich earth, abundance of wood, cultivated by true husbandmen, had a noble nature, had a best soil in the world, abundance of water, had an excellently attempered climate, abundance of animals including elephants; roots, herbage, woods or essences which distil from fruit and flower; and two harvests each year, in the winter fed by the rains and in the summer fed by irrigation from the canals. It had similar characteristic as the present-day Indonesia and Malaysia, characterized by major global key producers of a wide variety of agricultural tropical products, high levels of biodiversity and endemicity of flora and fauna, dense tropical forest, and rice cultivation cultures. It is also known that agriculture was started in the Far East over a ten thousand years ago, which proves the abundance of food needed to sustain a civilization large enough to create an army matched only by Plato’s Atlantean army. In Critias Section 114e, Plato informs us: “they dug out of the earth whatever was to be found there, solid as well as fusil” and, also, in Sections 116b and 116c that the citadel in the capital city was coated in various kinds of metals: “The entire circuit of the wall, which went round the outermost zone, they covered with a coating of brass, and the circuit of the next wall they coated with tin, and the third, which encompassed the citadel, flashed with the red light of orichalcum.” Sundaland, until today, is the producer of various minerals with relatively large quantities due to its geological and tectonic conditions that favor the formation of the mineral resources. Brass (an alloy of copper and tin), and tin itself, suggests that the Atlanteans had a considerable amount of both copper and tin available. Modern Indonesia and Malaysia are two of the world’s largest producers of tin, as well as having significant copper reserves, along with several other metals. In fact, the Southeast Asian countries produce approximately one third of all the tin metal in the world. Plato describes the plain as a level plain, surrounded by mountains which descended towards the sea, smooth and even, rectangular and oblong shaped, three thousand stadia (about 555 kilometers) long, two thousand stadia (about 370 kilometers) wide, looked towards the south, sheltered from the north, surrounded by mountains celebrated for their number, size and beauty; and had wealthy villages of country folk, rivers, lakes, and meadows. These descriptions are exactly fit with the geographical conditions configured on map generated by the author as shown on the following figure. 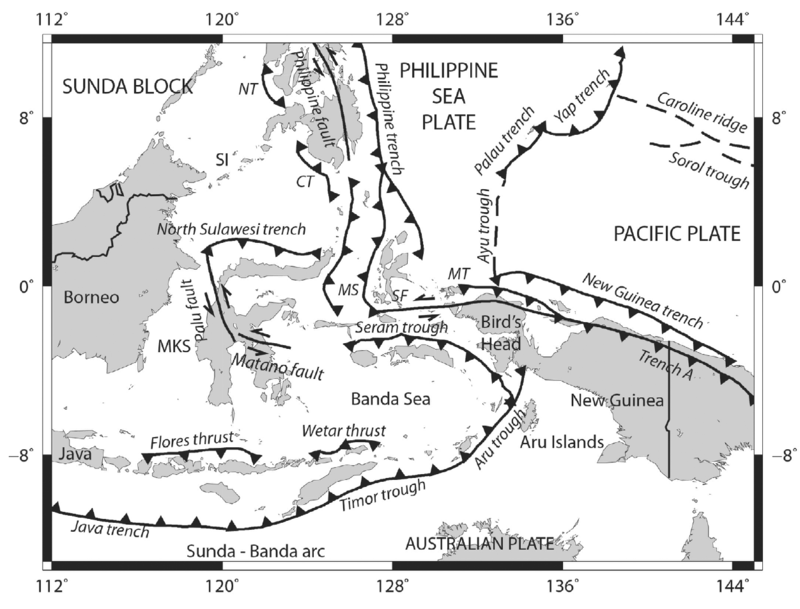 A level plain, smooth and even, descended towards the sea – The slope of the ground surface is mostly less than 1% declining southward towards the Java Sea and no visible mound on the whole plain. One may consider this as a very flat plain. The present-day conditions of the plain above the sea water level consist of swampy areas, tidal swamp irrigation practices, housing over water, water transportation, mangroves and peat land. Surrounded by mountains celebrated for their number, size and beauty – There are two mountainous areas around the northern part of the plain, Muller-Schwaner and Meratus Mountains. The highest peak on the Muller-Schwaner Mountain nearest to the plain is the Liangapran Hill with a height of 2,240 meters above the present day sea water level, while the one on the Meratus Mountain is the Mount Besar with a height of 1,890 meters. These mountains are mostly covered by primary forest, inhabited by enormous kinds of animals and as the inhabitations of the native Dayak tribes. Looked towards the south and sheltered from the north – These are true that the plain is open on the south and sheltered by mountains on the north. Rectangular and oblong shaped, about 555 kilometers long and 370 kilometers wide – The shape of the plain is rectangular on the southern part and oblong (elliptical arc) on the northern part. The size is almost exactly 555 kilometers long and 370 kilometers wide. Of course, the nature never gives an exactly regular shape to the geography of the land so that Plato’s descriptions are approximate to show the conditions in general. Wealthy villages of country folk, rivers, lakes, and meadows – The area of the plain in present-day conditions is located in a tropical rain forest region, has high precipitation rate over the year, has warm temperature over the year, mostly swampy and has many large rivers and tributaries so that the region is fertile and rich of food and daily necessity resources. Concerning the waterway system on the plain, Plato describes that there were four kinds of channels: the circular (perimeter) ditch, the inland channels, the transverse passages and the irrigation streams. The perimeter ditch was artificial, 100 feet (about 30 meters) deep, 1 stadium (about 185 meters) wide, 10,000 stadia (about 1,850 kilometers) long, carried round the whole plain, received streams from the mountains, winding around the plain, meeting at the city and let off into the sea. The inland canals were straight, 100 feet (about 30 meters) wide, 100 stadia (about 18.5 kilometers) intervals, let off into the perimeter ditch and as means for transporting wood and products in ships. The transverse passages were cut from one inland canal into another. The irrigation streams tapping from the canals were meant to irrigate the land in the summer (dry season) while in the winter (rainy season) had the benefit of the rains. These descriptions are exactly fit with the present-day water conveyor system conditions on the plain. 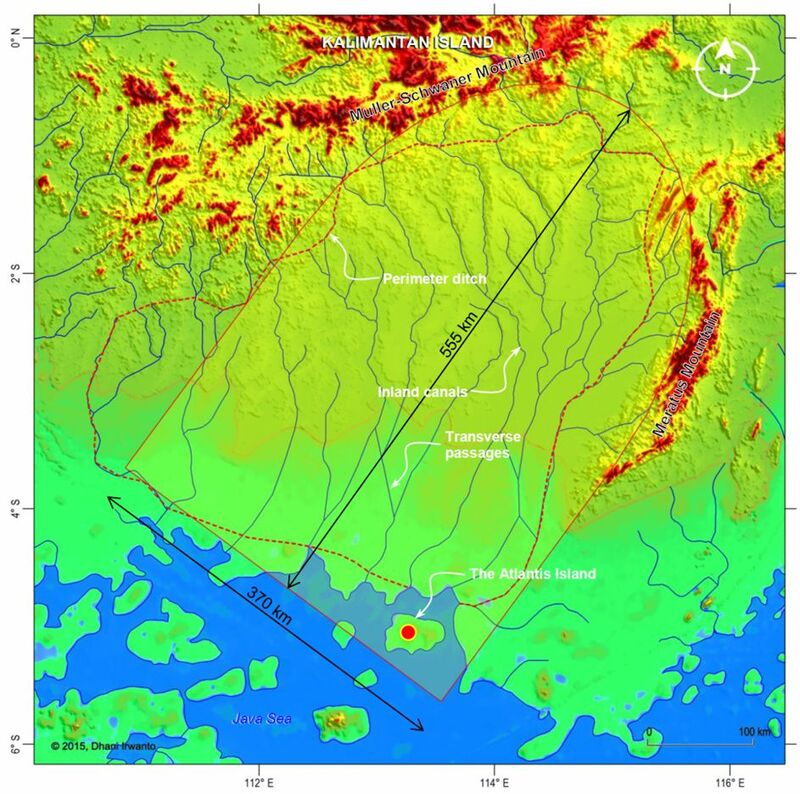 The perimeter ditch was artificial, about 30 meters deep and 185 meters wide – One of the river hypothesized as the perimeter ditch is the Barito River and probably the Negara River situated on the eastern side of the plain. Since this “ditch” had the nearest distance to the capital, the Egyptian was apparently passing it and reported. 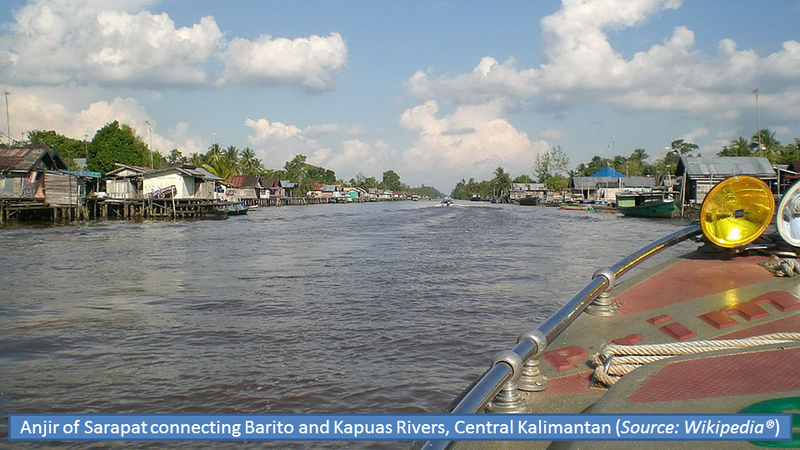 Barito River is the largest and the longest river in southern Kalimantan, which are about 1,000 kilometers long, 600 – 800 meters wide and an average of 8 meters deep. Flooding and sedimentation of the river on a very flat plain over the past 11,600 years have changed the regimes of the river but calculating the conveying capacity (area × velocity and assuming the same flow velocity because of the same gravitational energy slope), the cross section area of the flow (width × depth) as described by Plato is about 185 × 30 = 5,550 square meters while the area today is amazingly almost precise, 700 (average) × 8 = 5,600 square meters. The perimeter ditch was about 1,850 kilometers long, winding around the plain, meeting at the city and let off into the sea – Measuring the length on the map but considering the windingness factor from the topography, the resulted length is almost precisely the same as in Plato’s Critias, ie 1,850 kilometers. While measuring the square and oblong shape of the plain, which is 555 kilometers long and 370 kilometers wide, a perimeter length of 1,656 kilometers is obtained, also logically correct if the windingness factor is not considered. So, it is obvious that Plato is true. The perimeter ditch received streams from the mountains – This is true as the present-day rivers on the plain are originated from the Muller-Schwaner and Meratus Mountains. The inland canals were straight, about 30 meters wide, 18.5 kilometers intervals and let off into the perimeter ditch – The present-day rivers represent the inland canals are the Kapuas, Murung, Kahayan, Upper Barito, Mangkatip and probably Sebangau Rivers. The regimes of these rivers should have been changed over the past 11,600 years due to any processes of flooding, sedimentation, river bed movement and meandering on a very flat plain. Interchanges of flows and orders among the rivers might also occur. 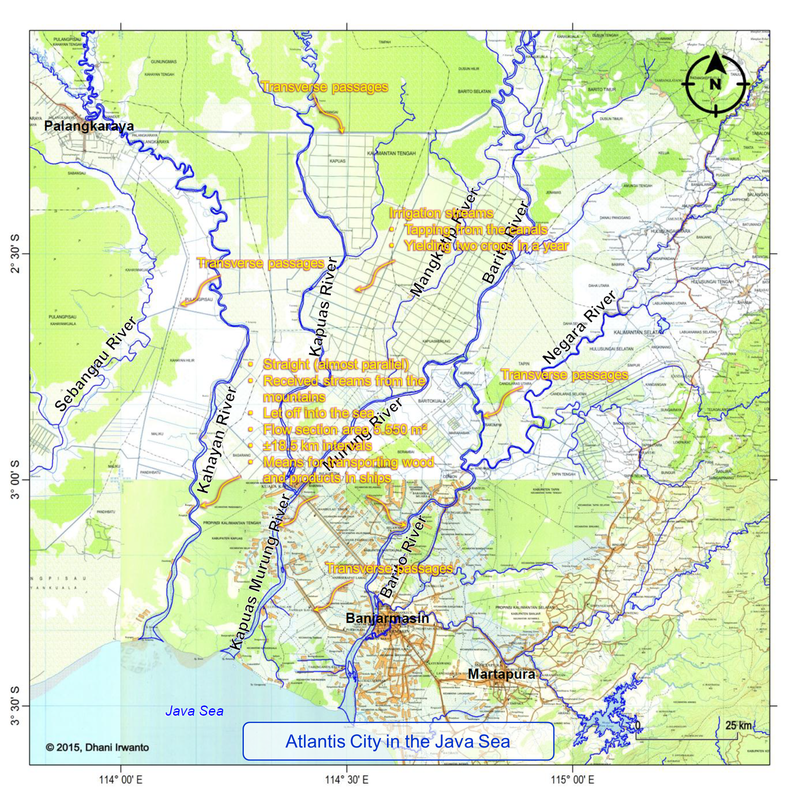 However, in general view the straightness and elongation of the rivers are preserved until today being parallel to each other and in the north-south direction, and in similar case as the Barito River, the widths have been widened. The average distance of these rivers is approximately 20 kilometers, also considered in close agreement to the Plato’s figure of 18.5 kilometers. The inland canals were means for transporting wood and products in ships – This custom is alive until today. Rivers are an integral part of everyday life of people in this region. Most of the rivers in southern Kalimantan are navigable. The traditional ship or vessel is locally known as “jukung” having many types or forms. These rivers and all their tributaries are a network of transportation system and become very important means for the people as every district is accessible by rivers. 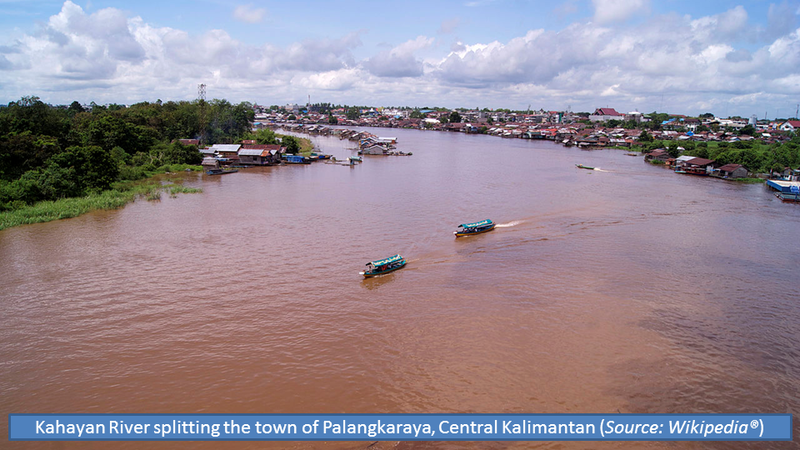 Since ancient times, the river network supports economic and social activities of the population of southern Kalimantan. Moreover, the river network has been the economic lifeblood of population because most of their economic activities are carried out through and in the rivers. Communications among regions in the hinterlands, the towns and ports in particular are also done via the river. The rivers become mainstays for the smooth distribution of goods and people from upstream to downstream and vice versa. Various types of forest, mining and agricultural products abundant in rural areas such as wood, rubber, gutta-percha, rattan, resin, jelutung (gum sap), wax, coal, gold, pepper, bird’s nest, woven material, dried or salted fish, deer jerky, fruits and many others are transported to collection points or ports through the river network. Instead, a variety of daily necessities such as rice, sugar, salt, flour, corn, palm oil, tobacco, gambier, pottery, household appliances, copper wire, fabric (linen) and so on are also transported from the ports to various areas in the hinterlands through the river network. The transverse passages were cut from one inland canal into another – This is exactly precise. Looking at the maps we can see numerous transverse passages exist in the region, some of them were built or rehabilited in recent times. The passage is known locally as “anjir”, a canal linking two rivers as part of the transportation network. The canals are also used as primary tidal swamp irrigation canals supplying water to and draining from the cultivated lands. The irrigation streams tapping from the canals supplied water to the land in dry season but rainfall in the rainy season yielding two crops in a year – This is also exactly precise. 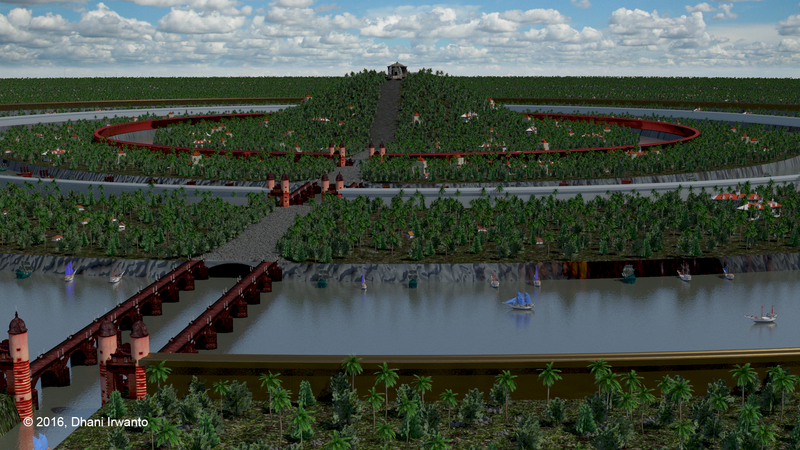 Today’s practices of tidal swamp irrigation system in southern Kalimantan is traditionally known as “anjir system” where primary canals called “anjir” or “antasan” were constructed connecting two tidal rivers, also used as navigation purpose. Inland canals were built to irrigate and drain the fields from and to the anjir: secondary canals called “handil” or “tatah” and tertiary canals called “saka”. During low tides, the canals drain the toxic water while during high tides fresh water enters the canals and conveyed to the fields. The system yields two rice crops in a year. 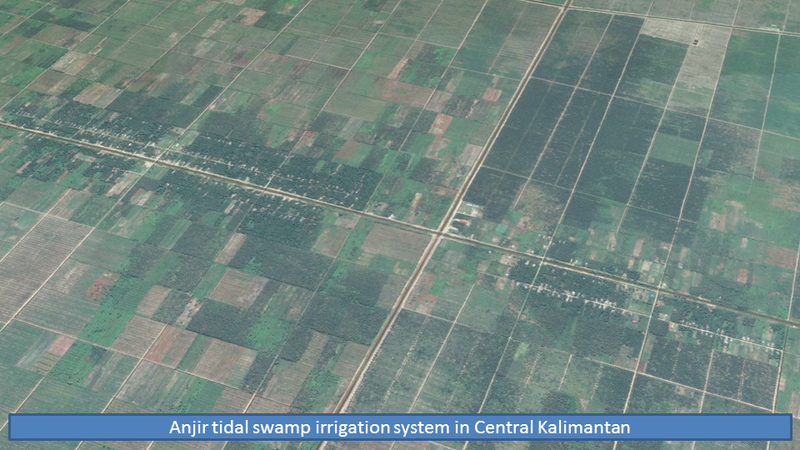 This system is also used to cultivate other crops or fish. Southern Kalimantan is today an exporter of rice to other regions. 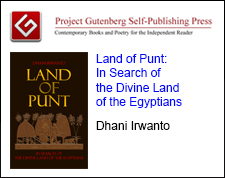 The author concludes that the canal system described by Plato turns out precisely the present-day river transportation network and the “anjir” irrigation system in southern Kalimantan region. According to Plato, the Atlantis Island where there was a harbor with a narrow entrance was in a sea surrounded by a boundless continent. 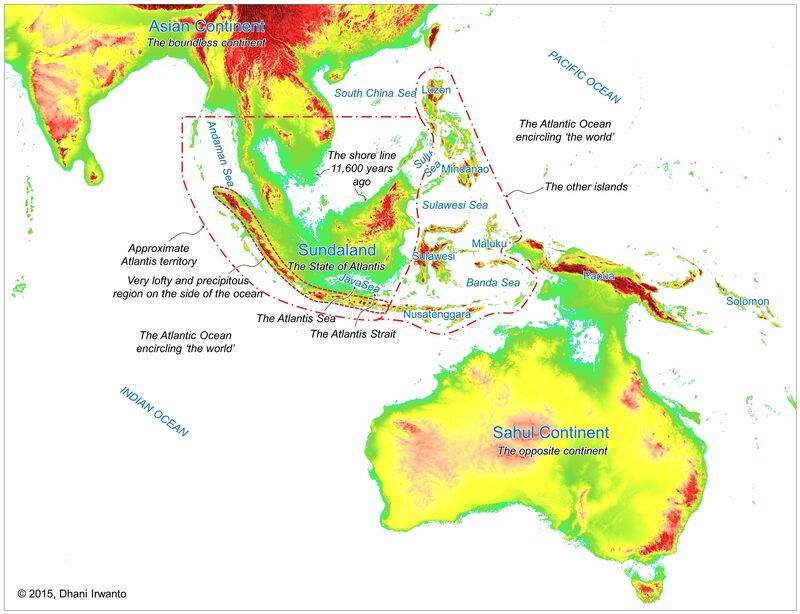 The hypothesized boundless continent is the main land of Sundaland attached to the Asian Continent, and the only sea surrounded by it was in those days the ancient Java Sea. 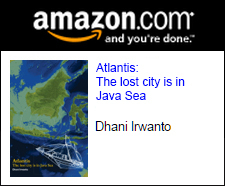 Therefore, the author hypothesizes that the Atlantis Island is located in Java Sea. 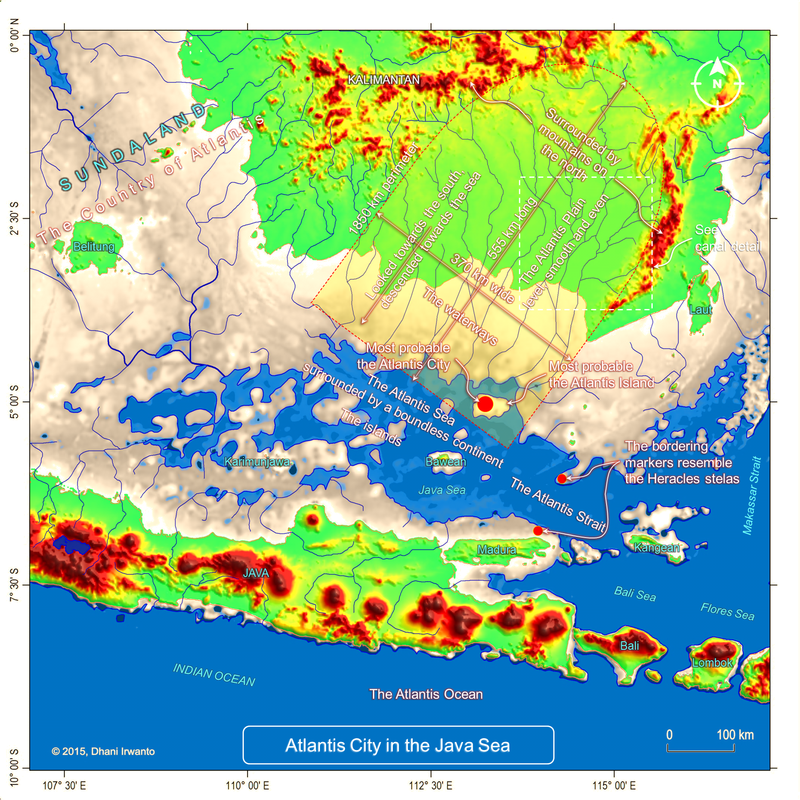 The Atlantis Island, where there was a central hill, was an island located near the main land identified from the elevation grids, where the sea water level was around 60 meter below the present-day sea water level, as shown on the figure below. As seen on the map, the island was situated in front of a strait separating the island and the main land. 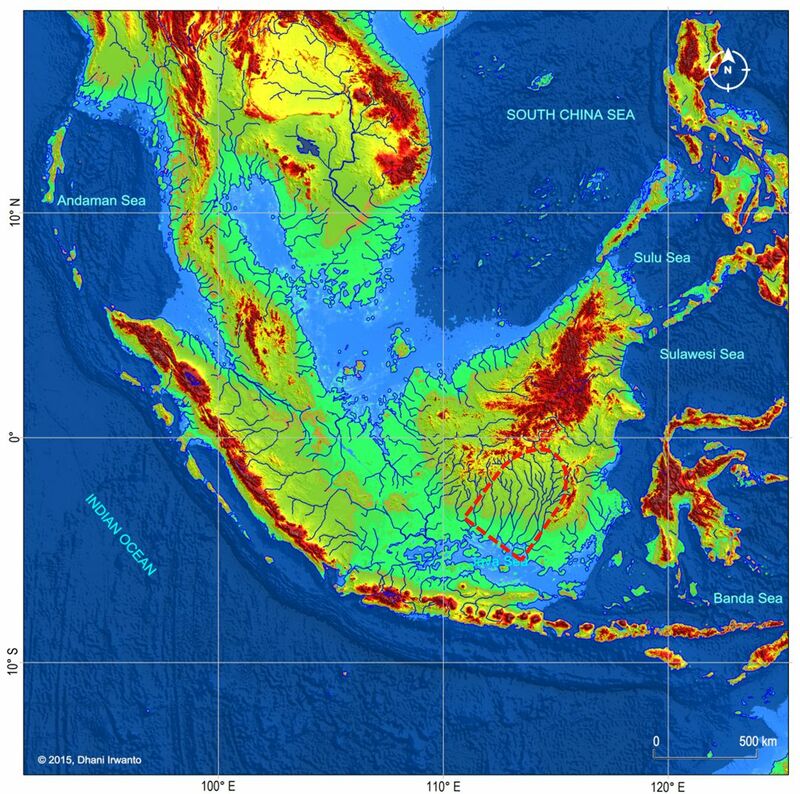 There was a relatively flat plain on the north; part of it is now the southern part of Kalimantan Island. The “real sea” surrounding the island is the ancient Java Sea which is a gulf with the entrance forms a strait. Crantor’s commentary as reported by Proclus stated that “… according to them, there were seven islands in that sea in their time …” and “… the extent of which was a thousand stadia [185 km]; …” is about right in describing the geography of the region in the Java Sea in those days. He describes that there were seven small islands and other three large islands, so in total there were ten islands in any sizes. 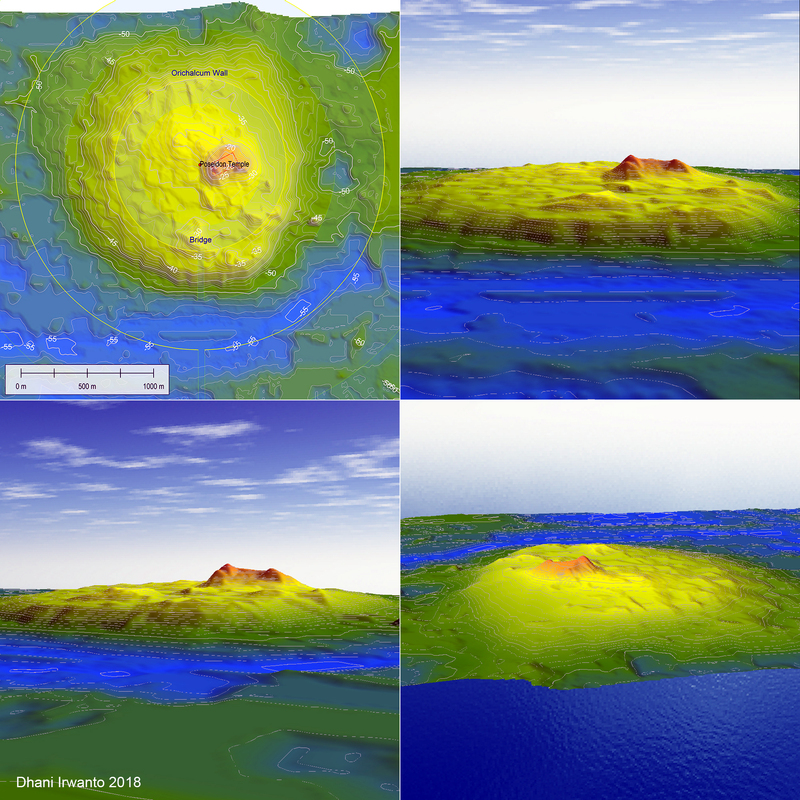 Although the number as seen on the map is not exactly the same due to the unknown process of sedimentation, scouring, littoral drift, limestone solution and tectonic movement over the past 11,600 years, the elevation grids have low accuracy and the author discards the small islands, the regional geography is generally true. The statement that “the extent of which was a thousand stadia (about 185 km)” is in general also about true. One of the large islands is identified as Bawean Island. 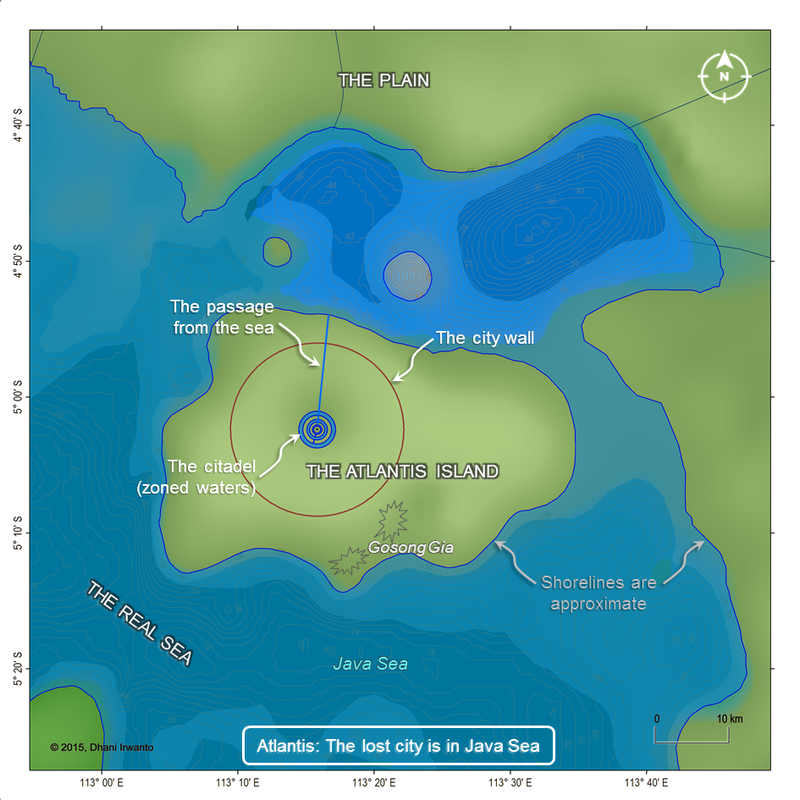 The author hypothesizes the location of Atlantis Island and reconstructs the city based on Plato’s descriptions, as shown on the following figure. The sea level kept rising until about 6,000 years ago. Corals grew on the solid structures, along with sedimentation and other processes. There is an existing coral reef named Gosong Gia or Annie Florence Reef at a site in the Java Sea believed to be the location of the capital city. 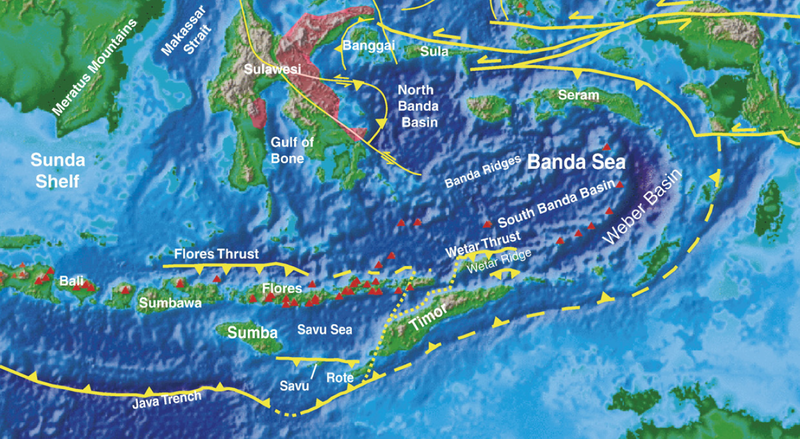 From an unpublished sonar survey of the site by a sponsor team, the top of the reef and the surrounding sea bed are about 10 and 55 meters below the average sea level, respectively. 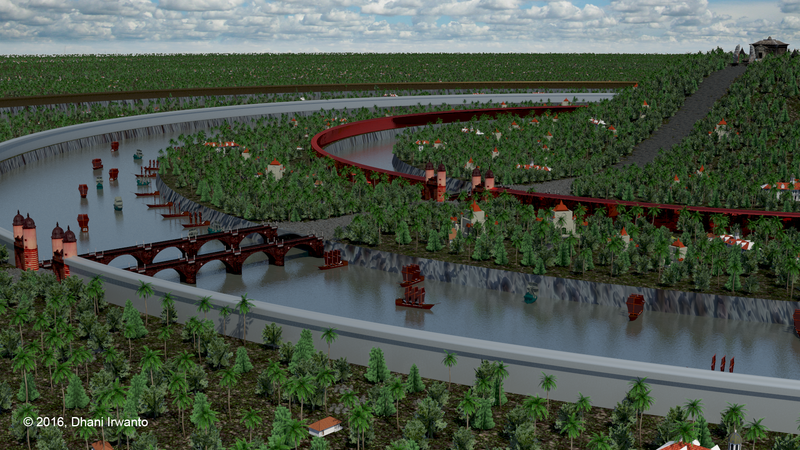 The city structures such as the hill, the circular wall, the circular channel and the bridge are still apparent from the patterns of the corals with exactly the same dimensions as those described by Plato. The depth of the surrounding sea here exactly coincides the land level about 11,600 years ago before the sea level rise. However, further investigations are required to confirm. The Plato’s description that “they had fountains, one of cold and another of hot water, in gracious plenty flowing; and they were wonderfully adapted for use by reason of the pleasantness and excellence of their waters” is noticeable. Bawean Island off in the Java Sea is a prototype of the Atlantis Island as it has the same environment, geological formation and tectonic processes, as well as situated close to Atlantis Island. There are several hot and cold springs in the island resulted from the tectonic activities in the region. The description that “the stone which was used in the work they quarried from underneath the center island, and from underneath the zones, on the outer as well as the inner side, one kind was white, another black, and a third red, and as they quarried, they at the same time hollowed out double docks, having roofs formed out of the native rock” is also noticeable. 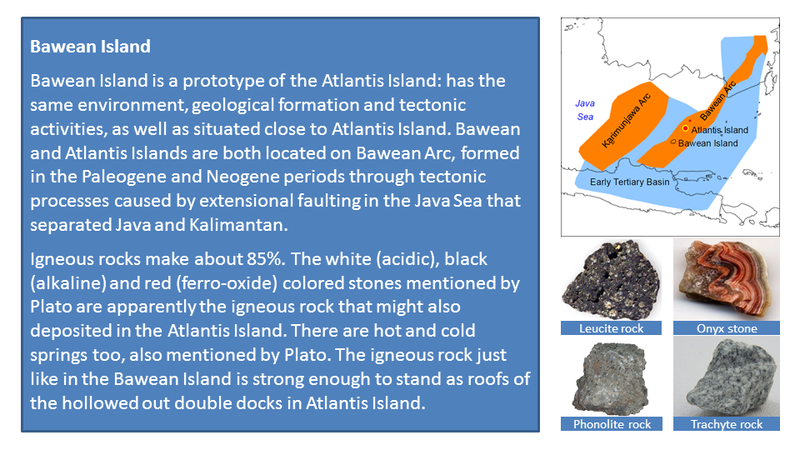 The white, black and red colored stones mentioned by Plato are apparently similar to the igneous rock that is deposited in Bawean Island with white (acidic), black-grey (alkaline) and red (ferro-oxide) colors, known among others as Leucite, Phonolite, Trachyte and Onix. The igneous rock just like in the Bawean Island is hard and strong so that it has enough natural strength to stand as roofs of the hollowed out double docks. 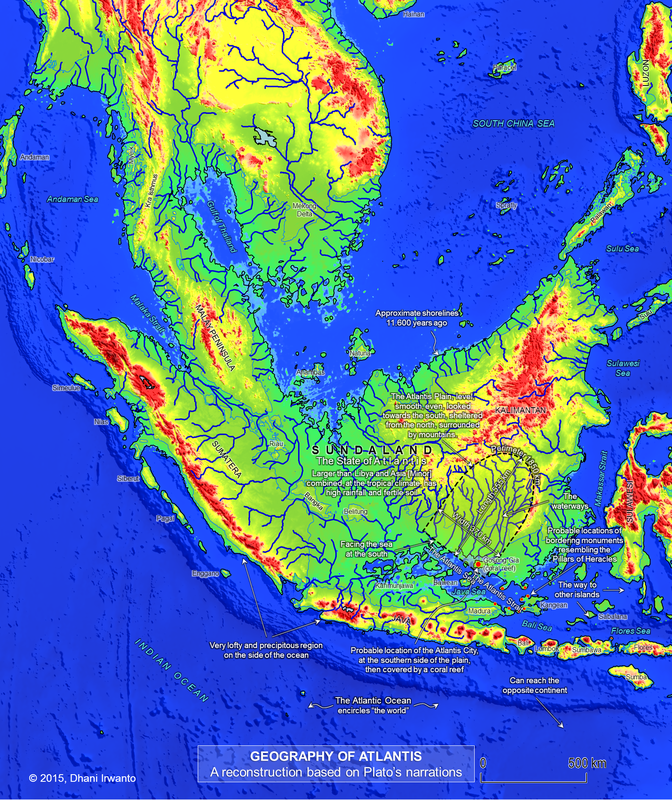 The Java Sea depth at the time of Atlantis (11,600 BP) was around 20 – 30 meters so that it was sufficient to enable the navigation of large ships. The location of the city in the island was very strategic. In terms of defense, there was an entrance (strait) and surrounded by a row of mountains and volcanoes. The sea was shallow and almost closed so that there were no significant waves. In Plato’s dialogues, the kingdom of Atlantis was founded by a god named Poseidon (Greek Ποσειδῶν) and the land was divided into ten portions given to his children. In the center of the citadel there was a holy temple dedicated to Poseidon and his wife, Cleito. In the Critias, Solon while wrote his poem translated the god’s name into “Poseidon”. Poseidon is one of the twelve Olympian deities of the pantheon in Greek mythology. His main domain is the ocean, and he is called the “God of the Sea”. Solon translated the name due to its similarity in the nature of the god. God Poseidon worshiped by the people of Atlantis is identical to Baruna, a pre-dharmic god, given the nickname the “Water God” or the “Sea God” in Nusantara (the archipelago) mythologies. So, Solon translated Baruna into Poseidon, a Greek “Sea God”, apparently. 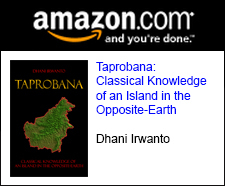 Kalimantan Island was formerly known as Warunapura or the place of the god Baruna. 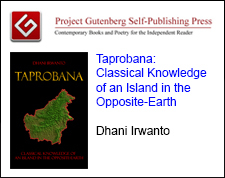 Next, Nagarakretagama manuscript mentions an ancient state that was within the Majapahit spheres of influence called Baruné, later identified as Barunai, a kingdom of the modern state Brunei. European sources further in the 16th century AD showed the name of the island as Burné by Antonio Pigafetta or Bornei by Duarte Barbosa. Chinese chronicles in the Song and Ming dynasties showed the name Boni. 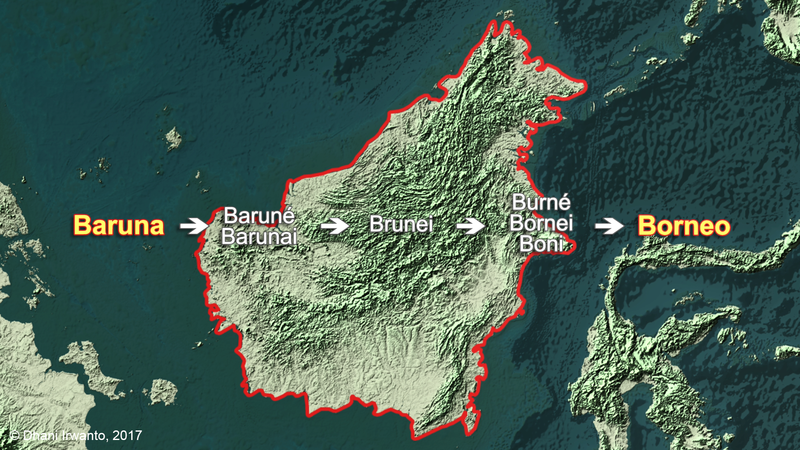 The Dutch and British colonials named the island as Borneo. 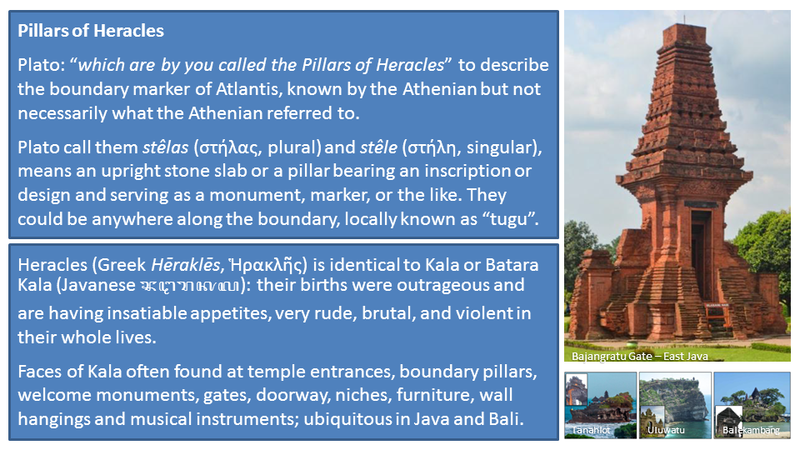 According to Plato’s text, Atlantis lay just beyond boundary monuments resembling the Greek’s Pillars of Heracles. For centuries, the location of the Pillars of Heracles is debated by many. The Pillars are assumed by some to refer to the Rock of Gibraltar in Europe and to Mount Acha near Ceuta or Jebel Musain, which are west of Ceuta in Morocco. Others prefer to accept them as a physical pair of pillars set up outside a temple. Classical writers frequently refer to the pillars without being in anyway specific regarding their location. The Pillars were, in earlier times, identified with the Strait of Sicily, but from the time of Erastosthenes (ca 250 BC) the term was moved to refer to the Strait of Gibraltar, reflecting the expansion of the Greek maritime knowledge. However, the poet Pindar in the Third Nemean Ode would appear to have treated the pillars as a metaphor for the limit of established Greek geographical knowledge, a boundary that was never static. Within the dialogues, Plato does not mention the Pillars of Hereacles as the hills around the Strait of Gibraltar; the latter were known later and originally called Calpe and Habila. In addition, the Egyptian priest called them “like the Pillars of Heracles”, so they are not necessarily the pillars known by the Athenians. Plato does not call them “pillars” but are “monuments” (Greek stêlas) which are located in the border and a strait to mark the boundary of the two countries at war. Heracles is identical to Kala (a pre-dharmic god) because both have similar conducts. Each of them is a child of a supreme god, either Batara Guru or Zeus. Their births were outrageous; Kala was born from an uncontrolled lust of Batara Guru on Dewi Uma while Heracles was from a seduction of Zeus on Alcmene. They are having insatiable appetites and being very rude, brutal, and violent in their whole lives. Apparently, Solon translated “Kala” into “Heracles” (Greek Hēraklēs, Ἡρακλῆς). The author hypothesizes the Pillars of Heracles as boundary monuments, locally known as “tugu”, decorated with the faces of Kala, such kinds ubiquitous in Java and Bali. Later on the author found an interesting chapter here. Plato mentions that orichalcum was a mineral product of Atlantis, unknown to Greek, being more precious in those days than anything except gold, and dug out of the earth in many parts of the island. 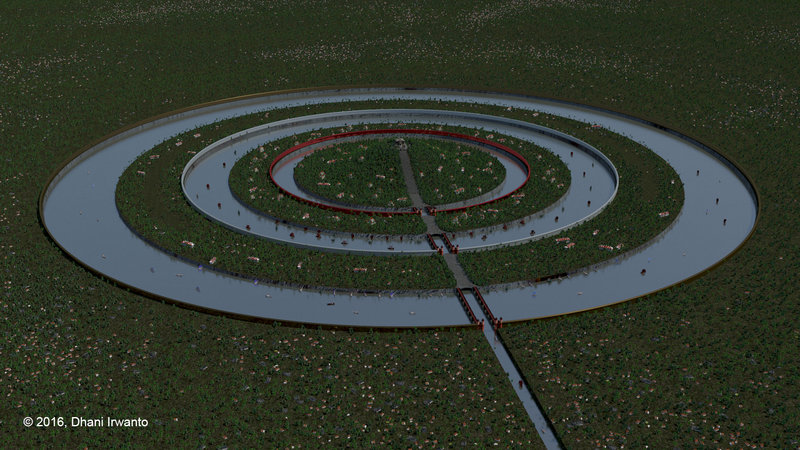 The ring of wall of the Temple to Poseidon and Cleito was covered and “flashed” with the “red light” of orichalcum. Orichalcum is composed from the Greek syllables oros (“mountain”) and chalkos (“ore”), simply means “mountain ore”. 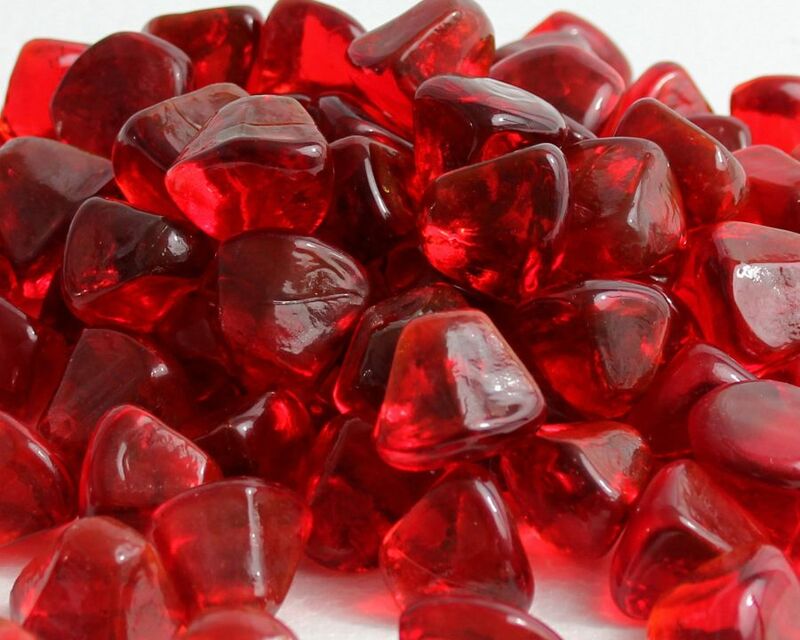 No known metal or its alloy has a red color so that orichalcum is not a metal. 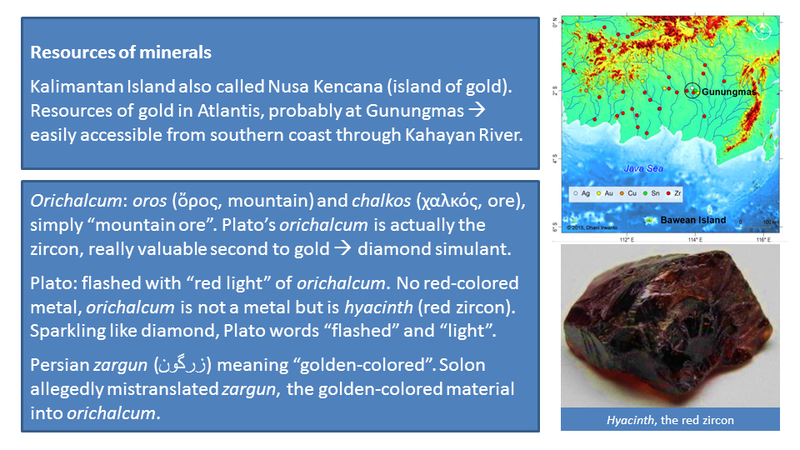 We could speculate that the Plato’s orichalcum is actually the zircon as this mineral can be “dug out of the earth in many parts of the island” or abundant in southern Kalimantan where the Atlantis plain is hypothesized. This material is really valuable second to gold; it has gemstone quality and is popular as diamond simulant. Zircon ore requires to be processed through extraction, refinement and heating (coal is abundant in Kalimantan) to bring out different colors of zircon products. The orichalcum which has a red color is particularly named as the hyacinth. When finished, its nature is sparkling like diamond that metals do not possess, which why Plato describes it with the words “flashed” and “light”, in particular. In “being more precious in those days than anything except gold”, Plato compares orichalcum with gold. “Zircon” derives from the Persian zargun, meaning “golden-colored”, corrupted into “jargoon”, a term applied to light-colored zircons which the Germans adapt to Zirkon. Allegedly, Plato or Solon mistranslated zargun, the golden-colored material into orichalcum as there was no such word in Ancient Greek. At the end of the Critias, it is described that in every five or six years alternately, the kings of Atlantis gathered to discuss and make arrangements, topped off with plenty of water buffalo sacrifice. 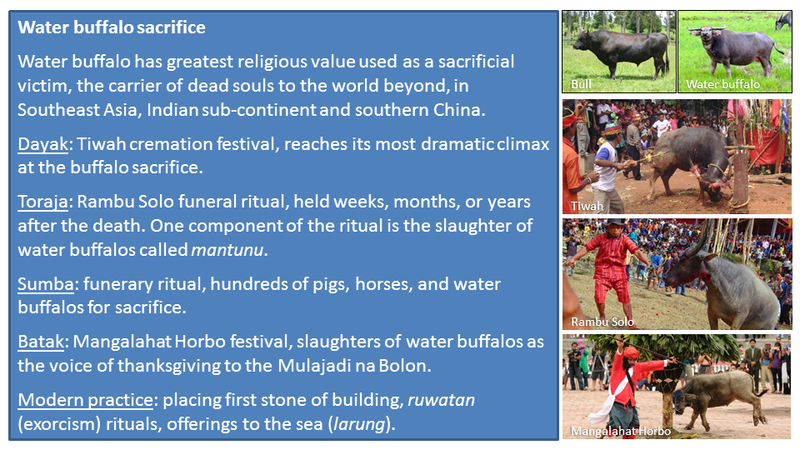 The tradition of buffalo sacrifices as offerings to the god exist only in Southeast Asia and southern part of Central Asia. Of course, Plato does not refer to them as “buffalos” because the animals are found only in those area, but as beasts resembling those of “bulls”. 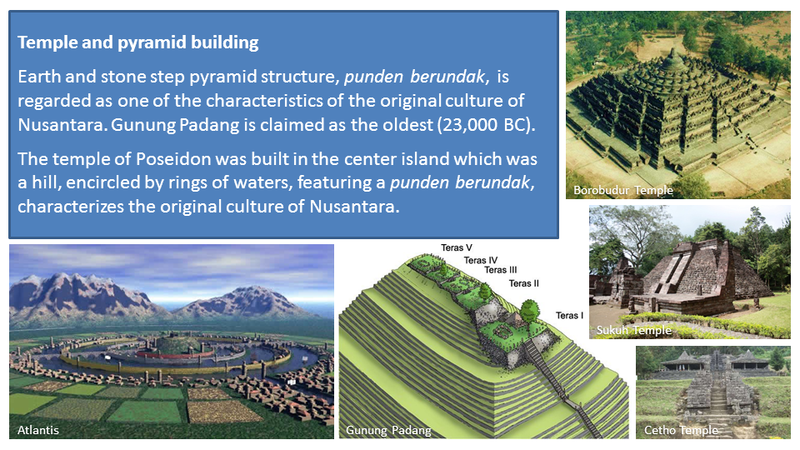 As well as menhirs, stone tables, and stone statues, Austronesian megalithic culture in Nusantara also featured earth-and-stone step pyramid structure, referred to as “punden berundak”, regarded as one of the characteristics of the original culture of the archipelago. These structures have been found and spread throughout Nusantara as far as Polynesia. Among them are found in Hyang-Argapura Mountains, Lebak Sibedug, Basemah, Pangguyangan, Cisolok and Gunung Padang; the latter of which is the biggest and the oldest megalithic site in Southeast Asia dated ca 23,000 BC or older (Natawidjaja, 2013). 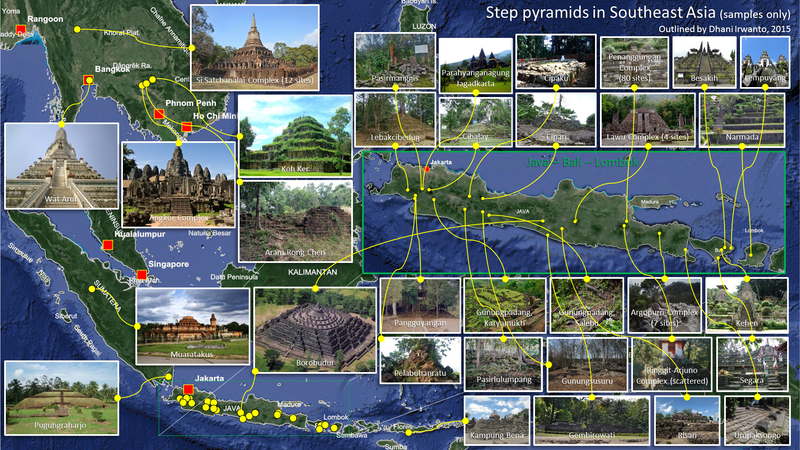 The Sukuh and Cetho temples in Central Java (dates are debated) show the Austronesian indigenous elements of step pyramid that somewhat resemble Mesoamerican pyramids. The step pyramid is the basic design of the Borobudur temple in Central Java, which allegedly built on the previous step pyramid. The construction of stone pyramids was based on the native belief that mountains and other high places are the abode of the spirits of the ancestors, or the most ideal pilgrimage places to worship them. They feel the need for pilgrimages, in addition to worship, to ask for help in solving the everyday life problems. In the development, they gave architectural decorations on the pyramids, which varies according to their cultures and beliefs. The shape of the structures then gradually transformed into temples. As said in Plato’s Critias, the temple to Poseidon and Cleito was built in the center island which was a hill, encircled by rings of waters. To reach the temple from the innermost ring of water, steps on the hill slope were definitely required. This could mean that the temple is featuring an earth-and-stone step pyramid structure, characterizes the original culture of Nusantara that is referred to as “punden berundak”. 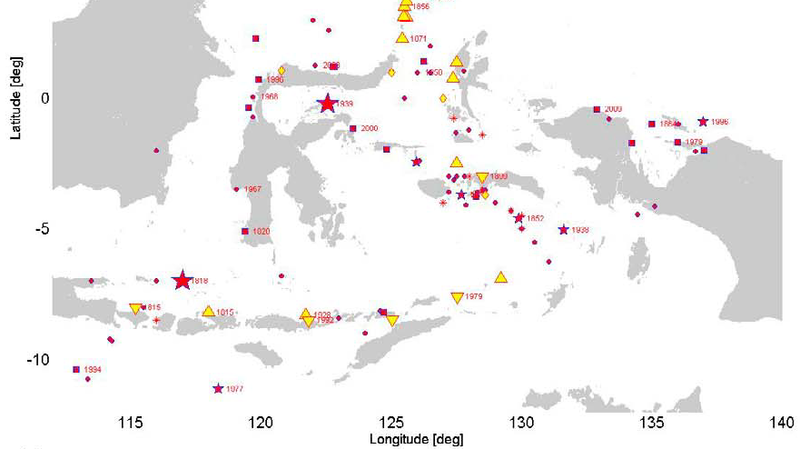 DNA analysis of more than 1,300 coconuts from around the world by Olsen et al (2011) reveals that the coconut was brought under cultivation in two separate locations, one in the Pacific basin and the other in the Indian Ocean basin (Baudouin et al, 2008; Gunn et al, 2011). 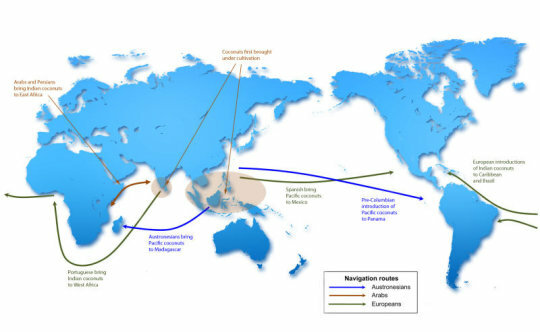 What’s more, coconut genetics also preserve a record of prehistoric trade routes and of the colonization of the Americas. 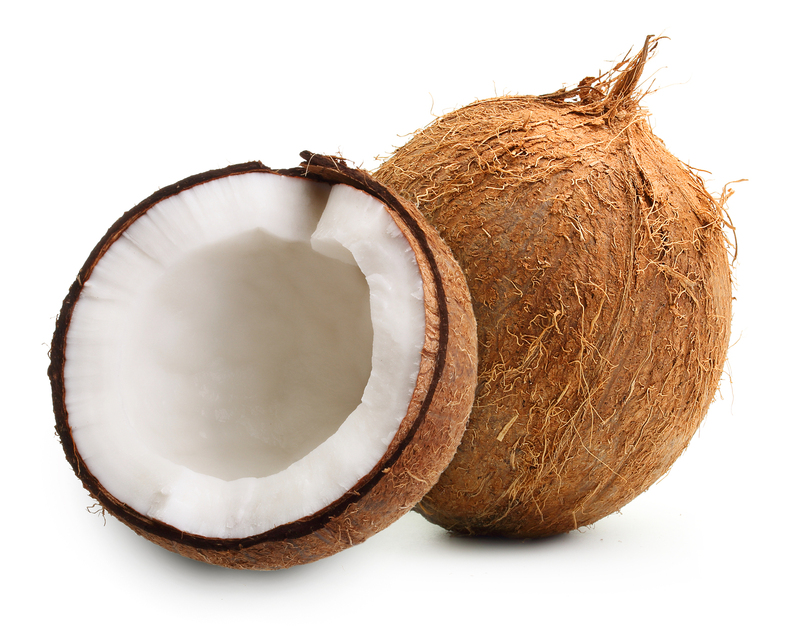 In the Pacific, coconuts were likely first cultivated in island Southeast Asia, meaning the Philippines, Malaysia, Indonesia, and perhaps the continent as well. In the Indian Ocean the likely center of cultivation was the southern periphery of India, including Sri Lanka, the Maldives, and the Laccadives. The Pacific coconuts were introduced to the Indian Ocean a couple of thousand years ago by ancient Austronesians establishing trade routes connecting Southeast Asia to Madagascar and coastal east Africa. Tapai or tape is a traditional fermented food as a dessert indigenous and popular throughout Southeast Asia. It is a sweet or sour alcoholic paste and can be used directly as a food or in traditional recipes. Tapai can be made from a variety of carbohydrate sources, but typically from cassava (Manihot esculenta), white rice (Oryza sativa) or glutinous rice (Oryza sativa glotinosa). Fermentation is performed by a variety of moulds by inoculating a carbohydrate source with the required microorganisms in a starter culture, locally known as ragi, including Aspergillus oryzae, Rhizopus oryzae, Amylomyces rouxii or Mucor species, and yeasts including Saccharomyces cerevisiae, Saccharomycopsis fibuliger, Endomycopsis burtonii and others, along with bacteria. Tapai is also used to make alcoholic beverages locally known as arak or brem. Tapai or tape is known in different names, in Indonesia as tape or tapai, Java as tapé, Sunda (western Java) as peuyeum, Malaysia and Brunei as tapai, Thailand as khao-mak, Cambodia as chao or tapai, and the Philippines as tapay or binuburang. Glutinous rice tapé ketan is a noted regale in Java during the idul fitri festival. See the list of evidence here.